The Planning Team is comprised of past Saline Leadership Institute graduates. This team works as the steering committee in overseeing the direction and growth of SLI. It is also responsible for coordinating each year’s class and serves as facilitators at the retreat and monthly sessions. 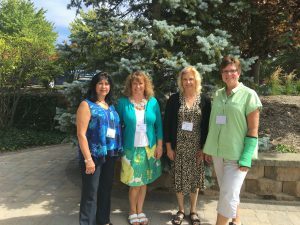 Shown in the picture are the SLI Planning Team Members who serve as facilitators at each session: (From left) Diane Mukkala, Kim Bryant, Sue Rantz, and Cheryl Girvan. The current full SLI Planning Team Members are: Diane Biondi Mukkala (Lead Facilitator and Presentor), Robyn Hughes (Facilitator), Brian Puffer (SLI/School Liaison) Cheryl Girvan (Facilitator), Dawn Ducca (Website), Samantha Nielsen (Marketing), Sharon Iverson (Administration), Christen Mitchell (Presenter and Community Liason), Karrie Waarala (Finance), and Mark Stevenson (Community Outreach and Recruiting).